WordPress website promoting product innovation & prototyping services. FooGallery plugin with Beaver Builder theme for easy to maintain, highly visual, page structure. iThemes Security Pro with Two Factor Authentication, All in One SEO, Clicky analytics, and Gravity Forms. 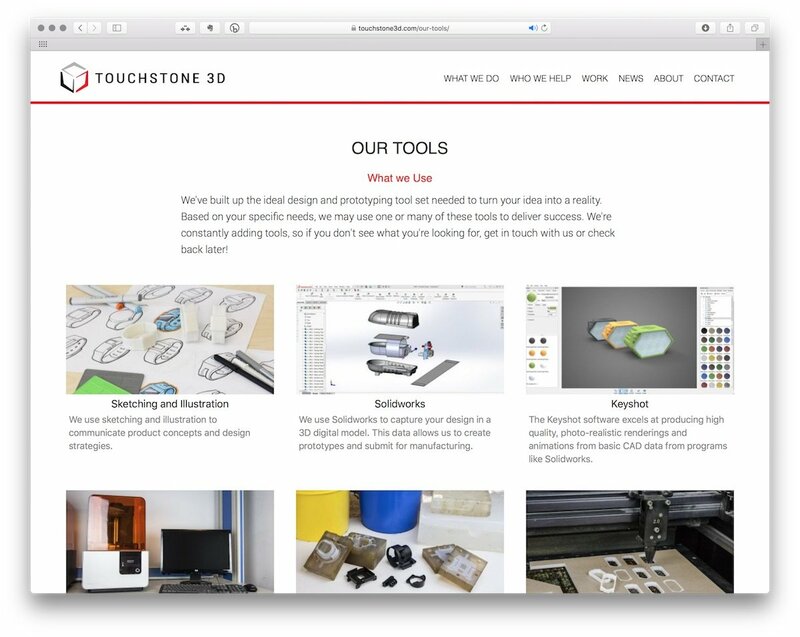 Touchstone 3D (TS3D) is a product development & commercialization company located in Cary, North Carolina. Continually expanding their portfolio of services and on-site manufacturing equipment, the company was due for a significant website update. Working with TS3D industrial designers, a new site was built and moved to higher performance hosting from SiteGround. The website can now allows the company to easily make their own updates & changes. PhpStorm, Chrome Developer Tools, custom code (PHP/JS/jQuery/HTML5, CSS3), WordPress, Beaver Builder Theme, Beaver Themer, Beaver Builder Pro, Ultimate Addon for Beaver Builder, All in One SEO Pack Pro, BackupBuddy, Clicky Analytics, FooBox Lightbox, FooGallery, Gravity Forms, iThemes Security Pro, iThemes Sync, Relevanssi. Most of the content Touchstone 3D Services wanted to show was visual rather than textual. A novel approach was used; many image galleries were created using the FooGallery plugin. These galleries were then positioned on the page using the Beaver Builder visual layout plugin and theme. Using this approach made it easy for the client to process their own updates - all they have to do is update the gallery. Since Beaver Builder leverages the Bootstrap framework, the site is fully responsive and looks good on devices ranging from desktop to mobile phones. All pages, posts, and images are SEO enhanced by using the All in One SEO Pack Pro plugin. Besides basic SEO, content is optimized for posting to Social Media and indexing by major Internet search engines. 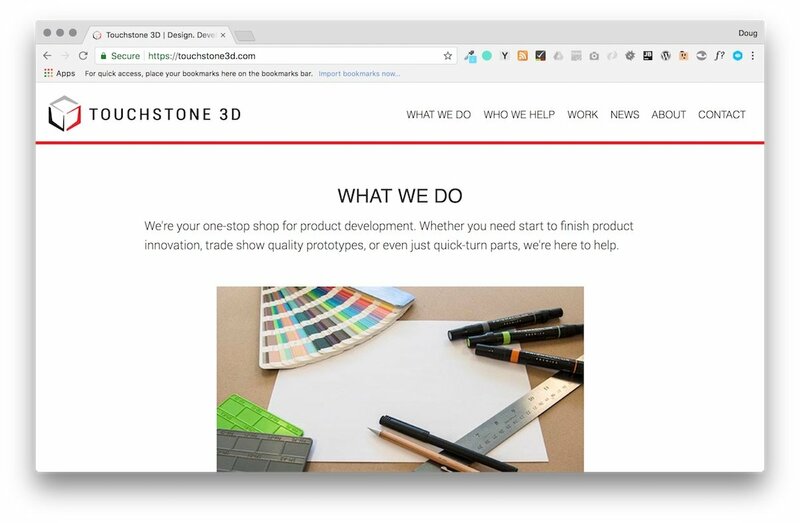 The previous TS3D website did not use https (see Why HTTPS Matters to understand why making the switch from http to https is becoming more important). Using Let's Encrypt certificates (Siteground makes these available with every account), the new site was implemented using Secure HTTP. The site is also strongly secured using the iThemes Security Pro plugin. Two factor authentication ensures only authorized individuals are allowed to edit site content. Using this plugin along with an extensive security configuration has successfully thwarted repeated hacking attempts. Easy to understand, yet detailed traffic tracking is performed by Clicky. A daily summary report is emailed to the client.